Intergalactic Expo is this Sunday May 6th from 10am-to 5pm. 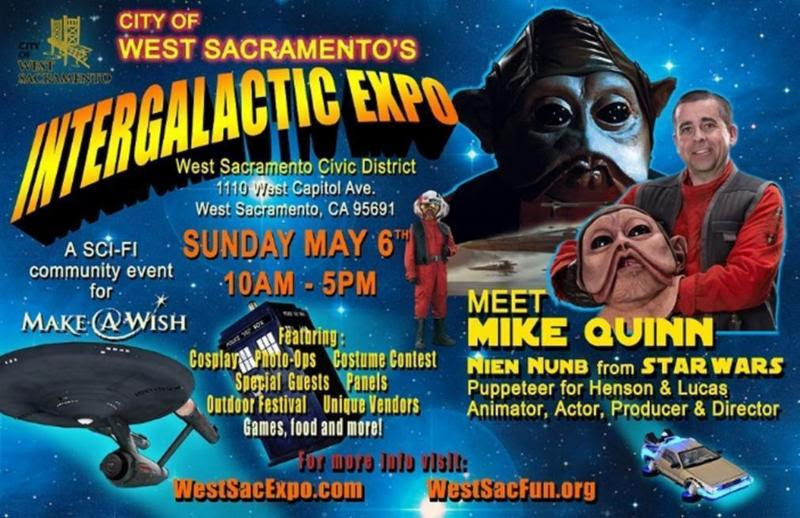 It is a special event celebrating Sci-Fi/Fantasy and pop culture, hosted by the City of West Sacramento benefitting Make-A-Wish of Northern California. The convention will be held in 2 large buildings, with outdoor events. A fun family friendly event you do not want to miss! West Sacramento Civic Center, 1110 West Capitol Ave, West Sacramento. *General Admission $10 at the door (kids 8 under free with paid adult). (includes free convention prints, exclusive patch, comic book, free play for mini games, priority seating for panels and more). Meet Mike Quinn, who played Nien Nunb from Star Wars: Return of the Jedi, The Force Awakens and the Last Jedi. Also in Return of the Jedi, he assisted performing Yoda with Frank Oz and many other creatures. Mike is a Puppeteer, Creature Performer, Animator, Actor, Producer and Director. He was chosen and mentored by Jim Henson to work as a Muppet Performer on many Muppet film and television projects, including The Great Muppet Caper, The Dark Crystal, Labyrinth, Fraggle Rock, The Storyteller, Dreamchild, Muppet Christmas Carol and more. He also worked on Who Framed Roger Rabbit? And Little Shop Of Horrors. A wonderful opportunity to meet the Star Wars actor, in his first appearance in Northern California! Mike Quinn will have many photos for sale, with $40 per autograph, $25 per selfie photo (no flash), or a $60 combo (1 autograph and 1 Selfie). C Andrew Nelson, who played Darth Vader in the Star Wars Special Editions. Jeffrey Weissman, most famous for playing George McFly in Back to the Future 2,3. R2-D2 and BB8 life size droid replicas from Star Wars! A Sci Fi movie prop exhibit, with screen used props and wardrobe from Star Trek, Stargate, Babylon 5 and more. A vintage Star Wars prototype toy display (showcasing rare unproduced figures and prototypes). Fan booths, meet some of your favorite cosplay characters (including characters from Star Wars, Star Trek, Avengers, Black Panther, Ghostbusters, Gi Joe). Lego build exhibit with a special charity raffle. Large Vendor room, buy collectible toys and memorabilia in a large exhibit hall with a live DJ. Special silent and live charity auction benefitting Make-A-Wish! Virtual reality booth, Escape Room mini game, art gallery, kids game area and much more! and a outdoor mini carnival with a kids obstacle course, and much more! Bid on our special charity auction! Some auction item highlights include: A rare Sacramento exclusive Disney Giclee , donated by Stage Nine Ent (valued at $695). An "Artist Proof" print numbered 1 of 4, showcasing a collection original Star Wars Rocket Firing Boba Fett prototypes (in various production stages). Exclusive autographed convention poster and rare comic from Sac Anime/ Sac Con. Rare vintage packaged 1980's Star Wars toys donated by Toy Fusion. and many more items from local businesses and vendors! We appreciate your support along with the City of West Sacramento, in helping our goal of raising $7,000 for Make-A-Wish! There will so much fun activities at this event, it will be a great way to share a day with the entire family!